As much as this play is best known for the Bear, there is far more to it, if in a rather schizoid fashion, that the right company of players can bring out. Fortunately, this is exactly what we have with this year’s Summer Shakespeare. Despite the Bard’s reputation, this play of Shakespeare’s seems startlingly nothing so much as a self-parodying mash up of Othello with his lighter comedy fare, with a paranoid King needing no Iago to turn against his wife as an adulterer on the flimsiest of evidence. However, while that plot’s resolution feels like a complete deus ex machina, it does provide a diverting frame for a diverting pastoral comedy in the spirit of As You Like It . The end result of the mix is a diverting story that takes classic Shakespearean tragedy into a comedic perspective even if it has to force in a happy ending by the crudest of means. Despite whatever weaknesses exist in the plot, the players make it come to life with passion and sincerity. For instance, Joel Szaefer as Leontes and Kaitlyn Rietdyk as Hermione enliven their roles convincingly as the King’s paranoia becomes an irrational persecution that the queen struggles to answer with firm reason. That interaction gives the initial plot its fire and emotional strength. When the plot moves to the lighter elements, it is gifted with fine comedic turns such as Will Nicholson as the Shepherd and Shawn McCarthy as the Clown who handle their material with confident charm. Two real standouts are Shree Ziradkar as Camillo and Denardo Hepburn as Polixenes, who effortlessly bridge the two plot threads with thespian skill that thematically would impress any tightrope walker. I was particularly impressed with Hepburn’s stage presence which has an irresistible regal quality that you can’t help but embrace instantly. As for the rest of the cast, they serve the production well, such as Jeff Nauta and Anna Lee-Diemert (as Florizel and Perdita respectively) as fine romantic leads with all the charm you would expect. Meanwhile, Shane McCartney is fun as that humorously incorrigible trickster, Autolycus, who easily holds the centre stage while the supporting players fill out the production with sumptuous style. In addition, the stagecraft has a startlingly practical simplicity with some options that are traditional and others I would not have considered possible before now. For instance, the costuming feels completely believable for its period setting, while the musical sequences in both singing and dancing have a professional level of excellence for this local production. 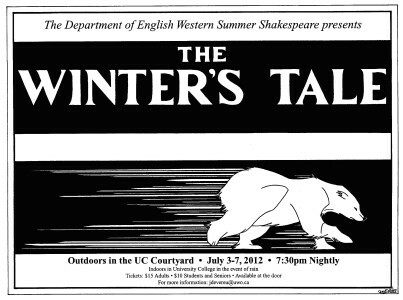 Put that in the courtyard of Western’s University College and you have a classic play that feels absolutely timeless. However, the role of the modern is given its due with stunning success. In this case, I was most impressed by the play’s use of incidental music which needs only an iPad hooked up to the speakers. I had no idea that piece of consumer electronics had such astounding utility and versatility to serve in theatre in ways that once needed elaborate professional equipment. As much as it seems obvious, it opens up exciting possibilities of theatre production values on modest budgets I look forward to seeing. As much as this play is one of Shakespeare’s lesser efforts, a combination of a talented cast and inspired stagecraft makes it a must-see summer treat.